Bio-Clock is the official partner of Dr.Pierpaoli® ! What is Melatonin ZNS ? Why Dr.Pierpaoli’s Melatonin ZNS is better than other one ? Melatonin Zn-Se of Dr. Pierpaoli contains the purest, most effective form of synthetic melatonin available; each tablet has been scientifically tested for biological activity and chemical purity. Synthetic melatonin is produced by synthesis from pharmaceutical grade ingredients, starting from serotonin extracted from coffee beans, and is molecularly identical to the melatonin produced in the human body. NEVER, EVER use "bovine", "animal" or "natural" grade melatonin. These grades of melatonin contain the actual extracts of the pineal gland and derive from animal tissue, which means it could contain viruses or proteins that could cause an undesired antibody response. Dr. Pierpaoli and his colleagues have investigated the possible mechanisms and also the molecules which presumably cooperate and synergize with melatonin in the regulation and re-synchronization of fundamental immunological and hormonal functions which are lost or deranged in the course of aging. During recent studies and long-term experiments with old rodents, it has been observed that zinc can correct completely aging-dependent immunodepression and several other hormonal and metabolic alterations typical of aging. It has been found that the low zinc levels in aging animals can be restored to normal values with nocturnal administration of melatonin or transplantation of the pineal gland from young into older animals6-9. Zinc is an essential component of more than 200 enzymes and one of the most relevant trace elements in the body8,9.It is thus clear that additional zinc must be supplemented daily to the body of an aging organism with a low zinc balance, in order that melatonin can better exert its anti-aging activities on the entire hormonal and immune systems! This important and novel scientific observation of the powerful anti-aging and immonoenhancing activity of the combination of zinc and melatonin has now resulted into the development of Zn-Se Melatonin of Dr. Pierpaoli! Also selenium is a fundamental trace element of the body and possesses powerful anti-cancer effects. Modern agriculture and alimentary habits have dramatically decreased the daily input of selenium from the diet. Selenium is essential for the enzymatic reaction responsible for the synthesis of glutathione, a powerful physiological molecule which constantly protects the body from oxidative damage. A lack of selenium will thus result into a loss of the detoxification capacity of the body, immunodepression and onset of degenerative diseases and cancer10. This is the reason why Melatonin Zn-Se of Dr. Pierpaoli combines, in a unique synergistic combination, three fundamental anti-aging molecules, where melatonin plays the master role for reactivation and restoration of its natural night peak to juvenile levels, this resulting into normalization of all measurable immunological and endocrine functions in the course of aging. The positive aging-postponing, metabolic and immunological effects of Melatonin Zn-Se od Dr. Pierpaoli can be easily measured by anybody by means of a normal periodic check-up!Although synthetic melatonin is one of the least toxic substances in existence and produces almost no side effects, it does produce somnolence (sleepiness) in most of the population at higher dose. Melatonin should not be taken with MAOI drugs, as MAOI's inhibit the breakdown of melatonin in the body. Melatonin should not be taken during pregnancy or while nursing. Melatonin should not be taken with alcohol, NSAIDS (anti-inflammatory medications) or beta-blockers. CONSULT YOUR DOCTOR PRIOR TO BEGINNING A SYNTHETIC MELATONIN REGIMEN. Melatonin Zn-Se and Menopause : WOMEN WAKE UP! Who is afraid of melatonin ? Since the publication in New York in August 1995 of the American bestseller « The Melatonin Miracle » (Simon and Schuster, 1995, authors W. Pierpaoli and W. Regelson with Carol Colman), now translated into 17 different languages, an oppressive air of suspicion and conspirational silence descended in old Europe upon the word « melatonin », only broken from time to time by isolated flashes of light, which in turn are immediately clouded by untimely, clumsy, overhusty interventions of the « insiders » of the press and television. In fact, the simple and clear scientific reality of the matter is not to be classed with day-to-day « disposable products ». It took millions of years for Mother Nature to elaborate its logical strategy, which we are only now starting to perceive and interpret. Few people read and try to learn and understand before opening their mouth, particularly newsmen and reporters. They must produce an inexhaustible supply of exciting news daily, while Mother Nature, fortunately for us, does not measure time or regard fashions. As my mother, a woman of central Italy, used to say : « They open their mouth and give out breath ! ». She was referring to politicians and their mental and personal deficiencies. The basic question is : « Why do we age ? » The answer is simple to the point that it sounds provocative and strange, and for many of my colleagues outrageous, as did the straightforward observation of Galileo to the Fathers of the Catholic Church in the Vatican: «And yet (the earth) it moves ! ». We age in a way similar to that in which we grow ! But then, what is melatonin needed for ? It inhibits aging . Why ? Simply because it prevents aging of the remarkable « switchyard » in the pineal gland (which truly is not a typical gland !). Nocturnal administration of melatonin prevents the pineal from deteriorating, from decaying into a heap of scrap, and thus from becoming unsuitable to deliver the precise signals which regulate the natural rhythms of day and night. These precise messages keep us constantly synchronized, through the hormonal system, with the environment in which we live. If and when we stray this natural pathway, we develop diseases and age more rapidly. The so-called reality of the world in which we live escapes our sensorial and psychological consciousness simply because we are an integrant part of it ! We navigate in a dimension whose nature and boundaries we ignore. Our only reference marks are the rhythms scanned by day, night and seasons. It would be like asking a fish to describe air, or a bird to say what life in the water looks like. But is not melatonin a true hormone? No. Can it produce damage ? No, melatonin is produced and secreted by different tissues and organs, but at night only by the pineal gland. Even at huge dosages and for very long periods, melatonin is totally harmless. Well documented data for this exist, but they are never mentioned ! However, a few (at most 0.3) milligrams of melatonin suffice to put the pineal at "night rest » and thus to protect the pineal, our hormonal switchboard center, from aging ! If the pineal does not age, we cannot possibly age or at least the aging process will never again be as we have seen and experienced it until now. Why Do I Address Women ? What is menopause ? Can it be prevented, delayed or modified ? If melatonin is able to decelerate or even to stop aging, what more suitable model is there than menopause ? We now have the answer, and it is extremely convincing.Our findings have been elaborated and are now in press. Nocturnal melatonin alone can deeply modify the hormonal and psychosomatic conditions in the perimenopausal years, which can extend from 40 to 60 years of age. Here we do not anticipate what will be published in official scientific journals, but only wish here to inform women about it in order to alleviate the countless problems they face daily in family and society. Menopause is simply the end of the hormonal «fertility program » of women, but this program is perfectly amenable to modification. It is not true that « the ovaries are depleted » !They simply atrophy according to their« genetic program ». But the expression of that program is purely hormonal, and we can restore the juvenile hormonal control of the ovaries. Certainly conditions of the juvenility and health of women are linked to maintenance of a juvenile hormonal status, which can be obtained with nocturnal melatonin administration. In perimenopausal women, melatonin in the most striking fashion reconstitutes the juvenile hormonal conditions and produces a rapid regression of all the neurovegetative and psychic alterations of menopause, in particular the states of nervousness, anxiety and depression. In addition, we can now address the issue of an impressive combination of melatonin with zinc. Zinc is a basic mineral in the body and essential for the function of over 200 enzymes that are fundamental for the respiration of all cells in the body. The combination of melatonin and zinc dramatically accelerates the effects of melatonin and boosts a depressed immunity. This is all documented. The answer to our queries is clear, simple and strictly scientific. Nocturnal administration of melatonin can resynchronize the entire hormonal system and, by protecting the pineal from aging, can maintain the juvenility of the pineal and its capacity to synthesize other very remarkable molecules. We found one of these molecules, TRH (thyrotropin releasing hormone), but it must be studied in detail before being used. (We found it 10 years ago, but it is not yet ready for use). At the present time only melatonin is available, which is better if associated with zinc, according to our studies This is all published in excellent scientific journals. Nothing is casual and extemporized ! Melatonin is, as I said recently in a BBC interview in London, a « gift of God » and can harm only those who do not take it. People (especially women) are now able to appreciate what hormonal and metabolic aging means, and thus also to prevent it. All others, let them wait to have « youth genes » inserted! At present, , 0.3 milligrams of melatonin and zinc are sufficient for me and all those dear to me before switching off the light and sinking into refreshing sleep….. Who is right? We shall see in a few years ! Pineal protection with melatonin means prevention of all diseases, including cancer! As extravagant as it may appear, the re-synchronization of pineal-directed central neuroendocrine (hormonal) cyclicity and its maintenance with nocturnal exogenous melatonin starting early in life, will inevitably maintain youthful conditions and avoid emergence of all kind of diseases. Even under the stressful conditions of life to day and the impact of a huge number of environmental "aggressors" on our body's integrity, melatonin will protect our "surveillance system", namely the vast array of cells and factors in the body which constantly survey and adapt our body to the needs of the situation. The immune system is under total control of hormones (17) and the hormones are under the total control of the "pineal network"! How is it possible to conceive the emergence of diseases under a condition of perfect immunological balance? This does not mean at all that we can cure all diseases with melatonin, but we can prevent all of them and, once unfortunately they have appeared, we can set up a very powerful emergency resistance system based on a series of immunopotentiating agents apt at "resetting the central clock" and make it suitable to delay and even arrest the course of the disease, be it a neurodegenerative disease (such as Parkinson, multiple sclerosis etc. ), cardiovascular diseases of all kind and finally cancer. This olistic concept of medicine has now found its biological and clinical evidence! After consideration and long meditation on the possible mechanisms of melatonin and its role in nature, I matured the conviction that melatonin possesses many levels of activities, which have been acquired in the course of evolution. As was used to say the great scientist Sir Peter Medawar, whom I knew and met many years ago: "it is not molecules which evolved but simply the use to which they are put". This means to me that also melatonin, together with other molecules I am now identifying or have already found, certainly possesses some effects of minor value, such as an antioxidant, or via receptor-mediated activity in the brain but, being melatonin a very ancient molcule in the evolution of life on our planet, its true nature is totally unknown and goes beyond our knowledge. It goes back to the origin of life and how light and darkness created the "life clock". Melatonin, thanks to its cyclical structure, to the presence of an acetyl and methyl group, must possess a mysterious bioenergetic potential which we are totally unable to perceive and understand. It is really a clue to the Creation!Thefore it is no wonder that its role and effects cannot be dissected by a number of "specialists", but only unified by a global biologist. Perhaps the next Stromboli Conference on Aging and Cancer next year, is a suitable place to unveil this new dimension of life and death in order that we can better adapt to the sad destiny of mortal mammals. After all, death at a very old age without diseases, not yet immortality, is our ultimate goal! Why does Melatonin prolong your life ? Melatonin prevents aging-related diseases, delays your aging, and automatically prolongs your life by simply impeding and postponing the progressive central, hypothalamic alteration of feedback hormonal regulation, as described beautifully by Dilman (12). It does so not directly, but rather smartly by maintaining youthful pineal function! In fact, obviously night administration of melatonin prevents the aging pineal gland from producing it. This regular night order "do not work"to the pineal, not only protects the "central hormonal director", but even induces a recovery of its regulatory capacity to modulate hormonal cyclicity, to the extent that the pineal gland recovers its juvenility. This is most significantly demonstrated by my experiments in which a young pineal gland grafted into a much older recipient induces a very significant life prolongation. Being the grafted pineal unable to produce itself melatonin because it is dissected from its neural connections, obviously the central "life clock" is located in the pineal itself but its mechanisms do not depend on melatonin! The aging pineal in fact loses its ability to produce a night peak of melatonin, being this a clear signal of its own aging. Therefore we have now shown beyond any doubt that exogenous melatonin, by protecting pineal aging through its positive feedback on the pineal itself, simply maintains the capacity of the young pineal to control cyclic release of all hormones, and it does this by maintaining and preventing pineal aging (8,9,13). Not only yhe pineal is our central "life clock", it also actively induces our aging in the course of its life, aging and death "program" (14). Clearly genetically and evolutionary originated mechanisms in the pineal gland modulate the course of our life and also generate the signals at the end of our life program. This is shown in the experiments we reported in a recent work (15). Therefore the basic mechanisms for our aging must be sought in our pineal gland and in its links to the entire neuroendocrine network (16). We age because our "pineal network" is "programmed" to deteriorate (12) and therefore we must use exogenous night melatonin in order to maintain its integrity and thus prevent the typical course of the aging syndrome inside the pineal gland. Only natural melatonin can protect the pineal gland from programmed aging! - Strengthens your immune system. - Maintains youthful health and vigor. When I refer to melatonin as a disease- fighting hormone, I am not just talking about some new treatment or cure for one particular disease or even several diseases. ProVision® is a further innovative formulation by Dr. Pierpaoli, a useful dietary supplement to prevent eye disease, one of the unpleasant effects of ageing. The ProVision® formulation has been developed on the basis of a clinical trial. LUTEIN, DRIED BLUEBERRY EXTRACT, ZEAXANTHIN, ASTAXANTHIN, MELATONIN, VITAMIN A, VITAMIN E, SELENIUM, ZINC , MAQUI . 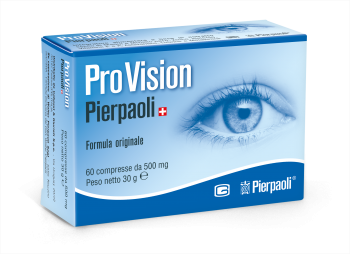 ProVision® is a further innovative formulation by Dr. Pierpaoli, a useful dietary supplement to prevent eye disease, one of the unpleasant effects of ageing. The ProVision® formulation has been developed on the basis of a clinical trial. Our eyes have not been created to be exploited all the time! With an advancing age, one of the major risks is the so-called “macular degeneration,” a progressive chronic disease of the central focal vision of the retina, namely the macular. This essential section of the retina slowly degenerates until its function is totally lost (blindness). The degeneration of the macular in the retina represents the main cause of blindness among the over-50s in the industrialized countries. For example in Italy, according to recent estimates, just under one million people showed the first symptoms of macular degeneration. According to the World Health Organization, 41% of blindness, (including partial), observed in countries enjoying a high standard of life, are due to macular degeneration. Recent data shows, nine out of ten people use their computer daily at work, or to study or to play games. Their destiny will inevitably be to develop one of the many visual problems. In recent years, the number of those who spend too many hours in front of a computer monitor has dramatically increased and now appears to involve about 88% of the computer-dependent population. On the basis of recent polls carried out in numerous European countries and in the United States, the majority of people are either not aware of, or underestimate the risks of being exposed every day (and in some cases even at night!) to the computer monitor. This danger is undervalued, and prevention is often totally neglected. Rules and guidelines exist to control those using a computer in the work place, but unfortunately these recommendations are far to often neglected. Even the places and rooms where we live or go out can be noxious for our sight. In discotheques, for example, the “assault” of a huge variety of wavelengths at high frequency cannot be “digested” by our eyes, which have for millennia been used to oil lamps and candles. Excessive heating of rooms produces a permanent dryness and dehydration of the eyes, irritating the conjunctiva and causing damage to the vitreous body. Driving the car, night and day, requires a relentless effort for attention and adaptation to lights and distances. In addition, night vision requires an adaptation performed by retinal cells (rods and cones), whose pigments are necessary to see in twilight. Secretion of tears is physiologically reduced during aging, in particular in menopausal women. This fact is dependent on an obvious modification of the hormonal balance. However, dry eyes are commonly produced in ambient environmental conditions (heated rooms with no humidification) and by air pollution. Also people sitting for hours every day (and/or night) in front of a computer can develop dry eyes. It is therefore of paramount importance to protect our sight and vision by protecting the retina! Dr. Walter Pierpaoli has been spent almost 50 years studying all pathologies linked to the retina, to ageing of the eyes in general and to the damage produced to the respiratory enzymes of the retina by excessive and direct light. He published his first relevant results originally in 1961! The formulation ProVision® Dr. Pierpaoli® has been elaborated with the aim to provide the full metabolic and oxidative needs of the eyes and in particular of the retina. One daily tablet of ProVision® at bedtime is a valid support for the nutritional maintenance of your sight! Since it is difficult to correct all our habits and working needs, we must help our eyes with a proper support of mineral salts and also of valid active biological substances. The ProVision® Formula of Dr. Pierpaoli® has been created by selecting the best ingredients in a highly purified form. ProVision® literally feeds your eyes, retina, macula and also your lenses. Moreover, ProVision® represents a necessary remedy for all those persons who will encounter a macular degeneration at some point due to their own “physiological ageing”. It is expected to affect many young people due to their lifestyle and bad nutrition habits. One tablet of ProVision® every day half an hour before bedtime or at bedtime is a very valid remedy for the nutritional support of our eyes. Age-related macular degeneration (ARMD) is the leading cause of severe visual loss in older people, in fact it is the main cause of central vision loss (blindness) in the USA today for those over the age of fifty; (Source: American Academy of Ophthalmology). Macular degeneration is a condition where the light sensing cells in the eye’s macula malfunction and eventually cease to work. Often individuals with macular degeneration will notice that straight lines, such as poles, walls or wires appear to be wavy; other symptoms can include blurred text, often with dark or even empty spaces that may block the centre of the field of vision. ARMD makes activities that require sharp vision, such as reading or driving, very difficult. A test to determine the presence of ARMD uses a so-called Asmler grid. This involves starring at a central dot to see if the lines around it are affected by blurriness, waviness or even are out of vision altogether. It is not yet clear how or why ARMD is triggered, although the main cause seems to be the hardening of arteries that supply the retina at the back of the eye. Over time, this deprives the tissues of oxygen and other nutrients that help to protect the retina, the consequence being a gradual deterioration of the vision. The central part of the retina contains a yellow pigment called macular pigment, which helps to protect the retinal receptors from sunlight, especially from the harmful effects of blue light. The decrease in density of this protective pigment can be linked to poor diet and in people who smoke, the protection from free radical damage is also seen as a key in the prevention of ARMD. Physicians classify ARMD into two parts, namely in wet and in dry form. The dry form affects 85% of patients with ARMD and thankfully is less progressive and not as severe as the wet form, however, up until now there have not been any successfully reported treatments in regard to the reversal of this condition. At present, most treatments for all ARMD’s have relied heavily upon supplementing the patients with nutritional elements, particularly lutein and zeaxanthin to alleviate, slow down and sometimes halt its progression. A recent and new study carried out by Prof. Walter Pierpaoli and by Prof. Changxian Yi from the Ophthalmology Center of Zhongshan University, Gouangzhou, P.R. China, brings now new hope to the millions affected by the degenerative retina disease ARMD (aging-related macula degeneration). Dr. Pierpaoli and Dr. Changxian Yi studied 100 patients over a period of 2-years in order to evaluate if the daily, evening treatment with the original formula of ProVision® is able to produce any change and improvement in the development and progression of AMD. Several studies have already shown that lutein, astaxantin and zeaxantin, all of them present in the ProVision® formula, could alleviate, delay and also rarely arrest the progression of the disease. It has already been shown in several animal studies that melatonin, which is also produced by the retina, is able to control eye pigmentation, thus regulating the amount of light reaching the photoreceptors (Pang, S.F. & D.T. Yew. 1979. Pigment aggregation by melatonin in the retinal pigment epithelium and choroid of guinea pigs Cavia porcellus. Experimentia 35: 213-233) and also that melatonin has the capacity to scavenge the toxic hydroxyl radicals from the retina (Tan, D.X., Manchester, L.C., Reiter R.J. et al., 2000. Significance of melatonin in antioxidative defense system: reactions and products. Biol. Sign. Recept. 9: 137-159). Accordingly, it was reasonable to think that the physiological decrease of melatonin during ageing may be an important factor in the dysfunction of retinal epithelial cells, a well known reason for the onset of AMD, and therefore to study whether melatonin could have an effect on the progress of AMD. The idea of Dr. Pierpaoli and Dr. Yi was to study and possibly show that the properly studied composition of melatonin, zinc and selenium contained in the original formula of ProVision®, could have the capacity to scavenge and to eliminate the toxic hydroxyl radicals and consequently help to protect the retinal epithelium containing pigments from the oxidative damage of free radicals, also taking into account the extreme avidity of retinal cells for oxygen-dependent phosphorylation for their survival. In fact this damage is considered to be the main cause of AMD. As stated by Dr. Yi, “Our aim was to explore a new approach to the prevention and cure of all kinds of AMDs”. The approach was straight-forward: first of all, patients with both types of dry and wet AMD were recruited. Then, tablets containing a combination of melatonin, zinc and selenium (3 mg melatonin-Zn-Se, original formula of ProVision® ) were given each night at bedtime (10-12 PM) for a minimum period of 3 months. 55 patients continued the treatment for further 6 months and some of them for 12 and 24 months. All patients were then checked at regular periods in order to measure the extension and the stage of progression of their AMD. The study reported that at 2-3 months of treatment the visual acuity had been kept stable, (in other words there appeared to be a halting of the progression of ARMD in general). It is worth noting that although this follow-up time is not long, this result is already better than the otherwise normal course that could be expected. For the patients who continued past 6 months and onto 12 months of nightly use of 1 tablet of the original formula of ProVision® the change in their fundus pictures were remarkable, (please note the “before” and “after” eye fundus pictures presented in figures 1-3). Figure 1 (above): The left slide shows the eye of a 67 year old male before treatment, his vision had been deteriorating for 2 years. The right picture shows the same eye 2 months later after daily ingestion of 1 tablet of original formula of ProVision® tablets. He now has stable visual acuity of 0.3 with remarkable improvements in sub-retinal macular hemorrhage. Figure 2 (above): The left slide shows the eye of a 71 year old female with ARMD who after 6 months of 1 tablet of original formula of ProVision® daily had her vision improved from 0.2 to 0.4 (as indicated in the right slide). Figure 3 (above): A 58 year old male whose visual acuity at the start (left slide) was 0.2 improved to 0.4 after 6 months of regular use of 1 tablet of the original formula of ProVision® . The sub-retinal hemorrhage and exudate was remarkably absorbed. At the end of the study, of the original 110 eyes tested only 8 eyes showed more retinal bleeding and 6 eyes more retinal exudates. In the vast majority there had been dramatically reduced pathologic macular changes. This was confirmed by the patients reporting better vision and general ocular experience with improvements to flare, dryness, clarity and comfort. Whilst the authors called for larger studies to confirm their findings, they concluded that; “ProVision® Formula supplementation among the aged population may be beneficial in preventing, relieving or reducing the severity of ARMD, which is one of the leading causes of blindness in the elderly.” What is also very important, during the entire period no side effects were observed.